"The title says it all-five ingredients, quick prep time, and tasty." Place the bacon in a large, deep skillet, and cook over medium-high heat, turning occasionally, until evenly browned, about 10 minutes. Drain the bacon slices on a paper towel-lined plate. Let cool, then crumble into small pieces. Mix bacon and feta together in small bowl. Cut a 2 to 3 inch slit lengthwise in the side of the chicken breast creating a pocket, and fill with mixture. Secure shut with toothpicks. 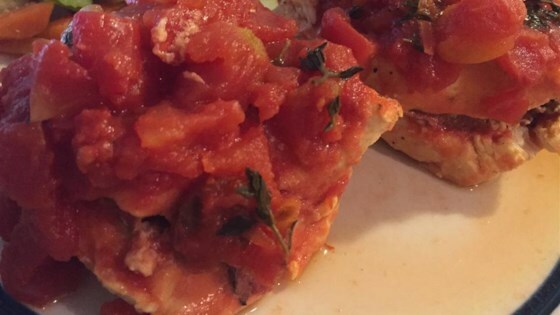 Place chicken in slow cooker, then add tomatoes and basil. Cook on High until chicken is no longer pink in the middle, about three hours. I made this recipe and used chicken thighs but didn't stuff them. I mixed bacon, feta, diced tomatoes, 1 tsp. of dried basis and poured over thighs in slow cooker. Very, very good!!! This wasn't my favorite. I love the idea, but I felt there was something missing. I do think I will try this again, but I will try different cheese and more seasonings. This was absolutely amazing. easy and fun to make and sooooooo yummy . Very delicious! The only things I changed were adding a few pats of butter to brown the boneless chicken breast and then made a balsamic drizzle to use before servings. Yum yum!! I loved this recipe! We changed it a bit and put a can of tomatoes with green chile's in it, for a little extra flavor. We'll definitely make this again!